Swimout apartments are the most sought after properties in Sea Temple resort as they have direct pool-side access to the stunning lagoon swimming pool. Swimout Apartment 175 is perfectly located in a quiet part of the resort with a west-facing aspect, which ensures that the private sun lounges are bathed in sun throughout the afternoon. Apartment 175 is frequently booked by return guests due to its exceptional location within the resort. This is the ultimate Sea Temple experience. Swimout Apartment 175 boasts 2 bedrooms, 2 bathrooms, 136 square metres of living space and features a patio area complete with lounge, daybed and a large pool-side pontoon allowing guests to simply slip into the lagoon pool. It is fully air-conditioned with ceiling fans throughout. The enormous living area includes a full-size kitchen with European appliances, a 6-person dining table and luxurious lounge with stunning décor. The master bedroom has direct access to the patio, dual vanity ensuite and a spa bath - guaranteed to help you unwind. The apartment also has laundry facilities, ample storage, 2 large flatscreen TVs, satellite television, DVD player and a stereo system. Also provided - a complimentary box of coffee capsules for the Lavazza coffee machine. A return shuttle bus service runs from Sea Temple to the centre of town every ten minutes. Or you can enjoy a leisurely stroll into town along the famous Four Mile Beach. Alternatively, you may choose to hire a car to discover the region with complete freedom - a remote controlled lock-up garage is provided. There are also numerous daytrip adventures for you to consider. This enormous 2 Bedroom Swimout is the perfect home base from which to explore tropical Far North Queensland. You can escape from the world in this truly luxurious apartment and experience the most relaxing holiday imaginable. I am an experienced Property Manager with 10 holiday-let properties in the Tropical North Queensland region. Having spent over 9 years in the holiday accommodation business I can ensure a well co ordinated booking process with local Housekeeping for all of your needs while holidaying in our apartments and villas. If you have any questions please do not hesitate to ask - I am always just a phone call or email away. This property was selected due to the perfect position within the Sea Temple resort complex. The spacious airy feel of this large apartment makes it ideal for family or friends to gather together or spend time relaxing in private spaces. Stunning decor and luxurious furnishings ensure that this apartment is the perfect home base to explore all that the region has to offer. A Sea Temple "Swimout Apartment" is the ultimate indulgence - with direct gated access to the magnificent 3,000 lagoon swimming pool in a quiet part of the resort. The onsite resort restaurant, pool bar, fitness centre and day spa complete the luxury holiday experience. 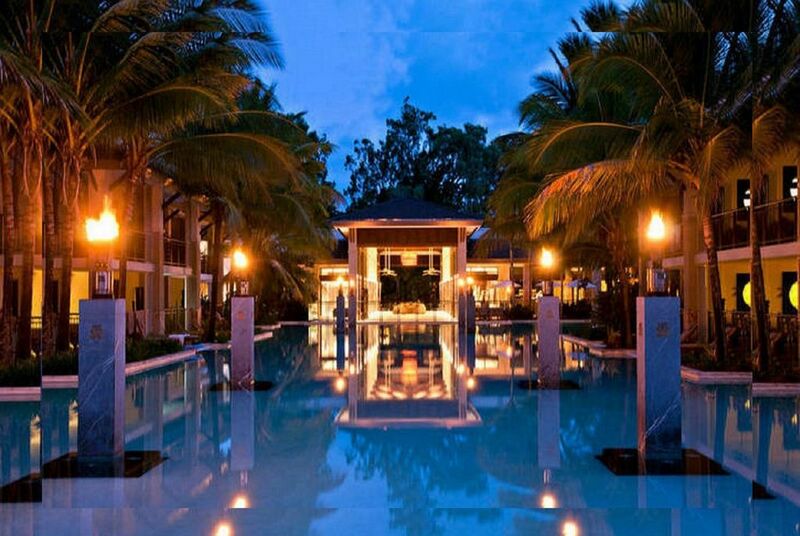 There is simply no better 5 star resort in Port Douglas. The beautifully finished master ensuite has double vanity, toilet shower and bath. Perfectly positioned in the stunning 5 star Sea Temple resort. Just metres from the iconic 4 Mile Beach. Sea Temple resort looks directly across the 5th fairway of Palmer Sea Reef Golf Course. Magnificent views of Daintree Rainforest ranges from the resort grounds. Sea Temple resort is a few steps along a private boardwalk to the beach. Apartment has ducted heating which is not required in Far North Queensland. Fully equipped laundry room in apartment. Lock-up remote controlled garage provided. Bath towels provided in both bathrooms. Apartment 175 is on the ground floor. Large open and airy space. Lavazza coffee machine with 1 box of capsules provided. Tea, Coffee Capsules, Sugar and Milk. Full range of kitchen utensils. Fully equipped kitchen with stone bench tops and European appliances. Stylish Balinese style timber dining table. Large flat screen TV in living room. 2nd flat screen TV in master bedroom. Satellite TV with many additional channels. Stereo system with Bluetooth connectivity. DVD player in lounge area (video store located in Port Douglas village). Lush, tropical manicured gardens throughout the resort. The alfresco patio space has direct gated access to the main swimming lagoon. Palmer Sea Reef Golf Course is adjacent to Sea Temple resort. Entire apartment is on one level. Large showers with wheelchair access. Enourmous 3,000 square metre central swimming lagoon. Communal spa in the resort, near the pool bar. Our first family holiday with my husband, our 4yr boy & 18month old girl. We stayed in a privately owned swimout apartment, and we loved every minute! The pool is absolutely amazing, hours of fun had in there, and so conveniently located right outside our room. There's a pool fence across our outdoor area, which made us feel safe the kids couldn't just run in. The restaurant staff were very helpful and the food was delish! The resort is located just a 2 minute walk from the beach, although it's stinger season so we couldn't swim, we enjoyed the view and beach stroll! Loved the location, loved the apartment, loved the resort! Would love to come back again one day! Fantastic apartment, the pool was amazing! Apartment 175 was just perfect, it really must be the best location in the whole Resort. Plenty of afternoon sun to sit and enjoy after a nice swim. Accessing our keys was very straight forward and we were welcomed to a nice cool apartment. We spent most of our time swimming, the pool temperature was perfect all day. The apartment was very comfortable with everything you need, home from home. We would definitely love to stay here again in apartment 175 although noticed it is now up for sale, I really hope it stays as a private holiday rental! Looking for a relaxing Christmas after a hard year, and not wanting to cruise or fly overseas we searched for something special at the Sea Temple (a property we know well). We must have picked the absolutely best apartment in the resort in this case.. On arrival from CNS, all tired and hot, we swung open the front door to be greeted with the air conditioning already on, the fans on, and a view straight out to the pool! Everything was immaculate and thoughtfully presented - soap and toiletries in the bathrooms, tea and coffee, (even some milk) And, gentle readers, all quality items as well! We could step straight into the pool, and the position of the apartment was perfect, far away enough from the main pool area so no noise at all, private and delightful. Oh yes, watch for those funny "magpie geese" who are around the pool and delight in waking up the resort around 0415! Just added to the ambiance, we miss them already! . Whatever you do, don't go past this apartment in your search, you are in for a wonderful experience here. . ps thanks also to Sharon, who maintains the cleaning and overall presentation for the owner, you had us at "hello" when we opened that door Sharon! We had a great relaxing time at this place loved every minute of our stay beds were comfortable enough room for 2 adults 2 children and an infant. Great having the pool right at your door step kept kids entertained so we could relax. pool was kept at just the right temperature so you could swim whenever you wanted. Great day spa at sea temple as well. If I had to say anything to be improved it would only be that we weren't provided with swimming towels and there was no internet. Loved this place and hope to re visit. Great accommodation, awesome location in the resort with pool at your doorstep! •	Mossman Gorge - swim with freshwater trout in crystal clear water. •	Silky Oaks - a magnificent restaurant and day spa set in the Daintree Rainforest. •	Barrier Reef cruises - there are many fishing & diving charter boats leaving Port daily. •	Sunday Market - set in the lush gardens on the foreshore every Sunday morning. •	Palmer Sea Reef Golf Club - a stunning course. The best hole is the 19th! •	Vie Spa – Sea Temple, allows you to rediscover essential sensory pleasures in a stunningly beautiful North Queensland location. •	Skyrail Cable Car – an amazing rainforest experience. •	Hartley’s Crocodile Farm – 20 minutes from Port Douglas down the Cook Highway.